Well, after a lot of work, I have finished a project that I think you might find enjoyable. Our friend, Jim Hartman, at the Mifflin Township Historical Society, graciously shared a copy of a 1940 Duquesne City Directory that was published by the Duquesne Police Pension Fund. Listed in this publication are over 180 businesses in Duquesne that contributed to the fund and as a result had their business listed. I am certain that there were other beyond the 180 listed who were unable to contribute, so this is by no means a definitive list of ALL businesses in Duquesne, only the ones who paid to advertise. Now, with that said, I am sure that many of these businesses had closed or were renamed by the time I was born in 1951. However, I recall a surprising number of them. They are listed by name, either of the business or the owner. Although 1940 doesn’t see too long ago, this listing will provide a snapshot of what Duquesne was like over 70 years ago. I’d be curious to see how many you recall and if any had been renamed in subsequent, what might we better know them as? Have fun check this info out. I was amazed to how many groceries and cafes there were!! I may have miscounted, but it apprears that there were at least 35 food markets of one type or another, 33 bars (aka – cafes). The last column on the chart indicates what the business was all about, if they happened to put that information in their ad. I find it amusing to see how many cafes claim to have the best beer in town! Who knew?!?!?! 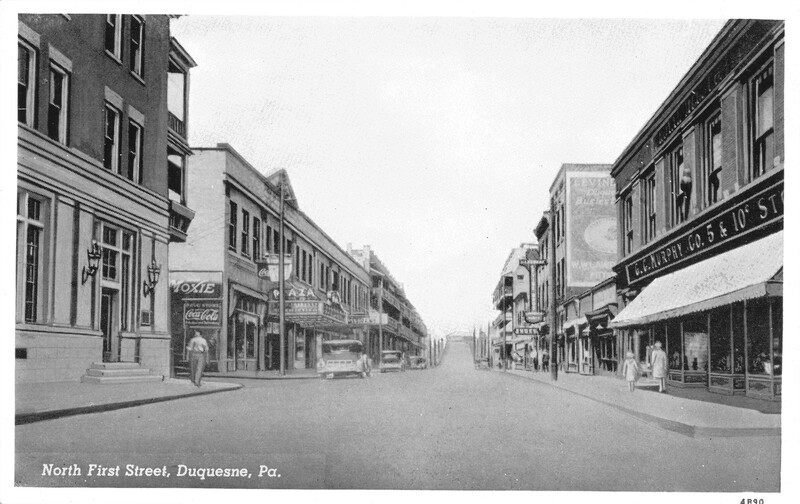 Enjoy this trip down the main streets and side streets of Duquesne in the 40’s!! Quality Groceries – John Harapas, Prop. Prescriptions – We Call For and Deliver – Night Service – James C Butler, Ph.G – Cyril D. Butler, Ph.G. Camp & S. Duquesne Ave.
Grant Ave & N. 1st St. Rooms and Board – A. Slavin, Prop. Dancing Every Thur. and Sat. Brings the Bakery to your Door. The Haller Man comes, you select what pleases you, and you’re sure it’s Fresh, Clean, Tasty, Wholesome – HALLER BAKING CO.
S.Duquesne Ave at McKee St.
Just call for your favorite Beer – We have it! Manufacturers of Staple and Non-secret drug packages, Specialties, Proprietary Remedies, and Private Brands – Successors of Saxon Laboratories – Factories in Duquesne, Pa., Brooklyn, N.Y., Chicago, Ill., Kansas City, Mo. “If you want a recommendation for Studebaker, ask the police” – New and Used Cars – Towing – Harry Soffer, Mgr. Vegetables, Produce, Meats and Groceries – Joseph Soffer, Prop. This entry was posted in Duquesne Buildings, Duquesne History, Stores and Businesses. Bookmark the permalink. Don Madak, If you graduated from D.H.S. in 1960, you probably knew Bill Kusleika – graduated same year. I am from West Virginia and married his younger sister, Susan (D.H.S 1964). The Kusleikas lived on Lincoln Avenue, Used to go to the GBU with their father occasionally. The graveyard they used in the Deer Hunter was on Center Street.It was a set built by the movie co.
You are forgetting Danny’s Cafe at 1313 Kennedy Avenue that was in business since 1960 until the mid 1980s. My parent’s owned that business. my grandfather lived in duquesne and i think he owned a pool room/candy store in the ’40’s.his name was harry bennett.know of him. my dad,also harry, graduated from duq. h.s. In 1960 I was hitch hiking home from Fort Dix New Jersey, wearing my Army uniform. Two older men picked me up on Rt 30 and said they would take me home, but first they had to stop at a bar on Grant Ave. it was 3 am. Having nothing better to do, I accepted. I remember the bar being on the south side of Grant Ave. I don’t remember which block. I’m not going to give the name of the bar, except it was a family name. We walked up to the bar which appeared closed, and one of the men knocked on the door three times. A peephole opened and words were exchanged. The door was opened and we walked into a full blown gambling casino. The pool table was modified for craps and they had a roulette wheel. It was like walking into another world. After that, I was driven to my door in the Riverview project in Duquesne Annex. It’s a nice memory. Mike Bilcsik, class of 59. I grew up in Duquesne from 1929 until 1956 when I got married, graduated from Univ. of Pitt and moved to Maryland and worked on the design of the first color television in N.Y. Living below the tracks in Duquesne in the 40’s was quite an experience since there were young boy gangs below the tracks and they would run up to first street and rob all the stores an run down to the vacant brewery below the tracks and divide the robberies. Then the police would chase them out and they would run a mile up to first and second street. I stayed in Duquesne 3 days in Sep 1966 with a family that I later became very close to. I’ll never forget my first night there. I was in bed and just drowsing off when suddenly there was a roar and rumbling. Then the black sky suddenly turned fiery red. It was awesome. I thought, “the Reds have dropped the bomb on Pittsburgh!” Yeah, I got the straight scoop the next AM. The next few days I met some of the finest people I’d ever meet, and experienced a very, very fine town. Fifty years (or so) later and old brain hasn’t yet deleted those memories, or stored them in “the cloud”. This is a terrific blog of a terrific community. Support it! Does anyone remember Sam and Helen Markides of Sam’s Tailor Shop on Grant Ave?? They were the previous owners before my parents took over in the 1980’s.. Ive been trying to find out what year they opened the business.. but not quite sure what year. Knew them. My dad had a store on meadow street. I know their son Jim. Hi. Do you remember the bar on the corner of Meadow and Hamilton? If so, was it called Toomy’s? My great uncle “Toomy” Thomas (Tamas) owned it. Also, does anyone know who owned “Elsie’s” on Grant Avenue? Thank you! Sam Markides was a wonderful man. He would do the ironing in the front store window and had never known him to miss the opportunity to wave at people as they went by. I don’t know what year he started but my earliest rememberance is from approx. 1944 or so. Sam and Helen Markides were my parents. I don’t know what year the business started, but I would say it was in the 1930’s. How are you? You may or not remember me but I’m Kim, Lan’s daughter. How is Mary Stella? I haven’t spoke to her in a long time? Also I did some research and I’m pretty sure the shop was opened in 1935. Mary-Stella is fine. Still in Chillicothe, Ohio. We have been in South Carolina since 1983. I am still working – having too much fun to fully retire from our jewelry store. My dad couldn’t make me a tailor, but I am working with my hands on silver and gold instead of cloth. I am glad you were able to find out more information about when my dad started his shop. When I was a kid I would look at his books back into the thirties and see all the daily entries he kept, adding up all the sales by hand! Stay in touch! Hi. This is Mary-Stella Markides. I retired from teaching and I stayed here in Chillicothe, Ohio. As I remember, the story of my parents in the 522 West Grant Avenue store, it was the third tailor shop in Duquesne in which Dad had worked. The first was on Grant Avenue near Elsie’s News. Dad and his brother A. D. Markides (everyone called him “Tom”), started this store together. My parents married and Dad soon left the business. He worked at the mill until a man offered him a store either on or near the corner of Grant Avenue and Fifth Street. The man knew Dad did not have rent money, but, he said that he knew Dad would pay him rent as soon as he could. Remember that a man’s word and a handshake were all that honorable men needed then. Dad later bought the store at 522 West Grant because it was larger. He also either added or remodeled the apartment upstairs. I do not know the name of the man who rented Dad his first store without his older brother, but, when Dad sold the store to your parents, he felt that he was “paying foward” the kindness that was done for him. Sam and Helen loved your parents and you children very much and appreciated the kindness and respect with which all of you treated them. read and learn more about our little town. Does anyone remember my late father? He’s Joe Dubyak from J Dubyak and bros. He was a huckster before ww2. They lived at 421 cedar St. I was only 3 when we moved from 848 state St. to Irwin. That was 1959. I vaguely remember going to helmezzys store. I was very young. Dad passed in 2008. He was 91. The best dad anyone could hope for. Don, sorry I don’t remember you; in 59, I was only eight. Helmeczi’s was my second home; I grew up at 910 Maryland directly behind Steve Farkas’ tavern on the corner of Crawford and Collier Alley. Steve’s daughter gave me their glider from their back porch 30 years ago; reupholstered and repainted, it’s on my back porch right now. Poor Steve is probably rolling in his grave because of the several drug related shootings and a murder in his old watering hole… but those WERE the DAYS. I still come to Duquesne for work. I’m in the insurance business. I work with medicare beneficiaries. I often wonder about my dad Joe Dubyak and his huckster brothers. I have a picture of dad standing next to his J DUBYAK BROS truck. Let me know how I can forward a copy. I’m guessing 1940. I do remember the Dubyak family name. There are a lot of names I remember from my childhood (’44 to ’62) in Duquesne that have a familiar ring to them. Unfortunately, I can’t recall anything about them. He huckstered before my time. Just out of curiosity if you don’t mind, why did your family move to Irwin? The house on State St. was too small for 6 people. It’s actually North Huntingtdon. It was spacious in 1959. Now it’s like Monroeville. I think dad liked the rural environment. Just a guess. I was only 3 years old. and of course going “downtown” first street on a Saturday morning. who lived on what street and things that happened in town when he was growing up. South Grant Street. May have been Mill Street??? Did he know any of the residents? Word has it that my late Uncle Ken Matta (from the Mckeesport Matta family) was on R&R during WW2 and stoped into the Green Gables Inn on Duquesne Blvd. one night. There was an all girls band performing and the girl playing Bari-Sax caught his eye. And soon my Aunt Bernice became his wife. A great true story to add to the “Duquesne Hunky”. I can’t believe 50 years since high school. I’m starting to feel old. 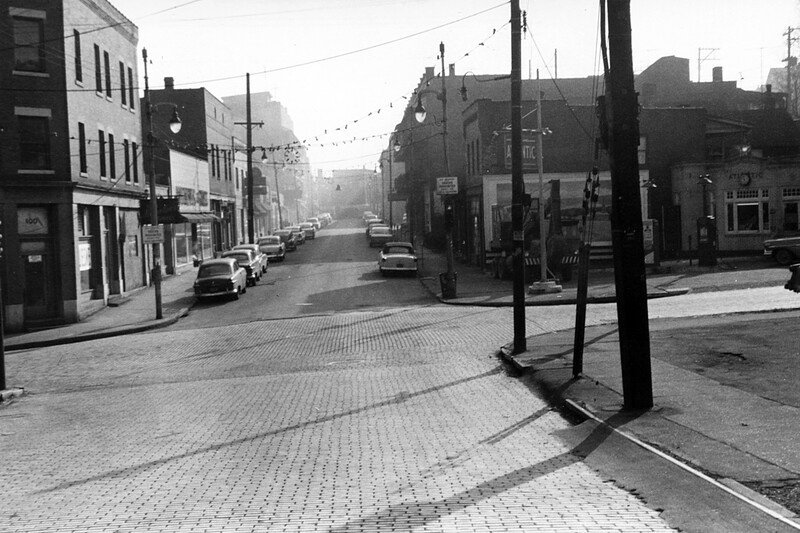 I grew up in Duquesne and have some very fond memories of my life there. I moved away in 1971 around my 21st birthday. I remember getting my hair done for the proms and high school dances at a beauty shop on Grant . I beleive it was called Dolly’s? I remember the library and spending many evenings there doing homework. The librarians name was Miss Gross if I remember correctly. Do they still have the park at the corner of Grant and Second? And the war memorial next to the high school? I haven’t been that way in about 20 years. The house I grew up in was torn down. It was just below Second on Whtfield and a block over from Library Place. The first movie I saw at the theater was “The Invisible Man” with Pa and my older sister and my twin brother. Duquesne was something in its day. Too bad that it changed over the years. I’m sorry that the young people there today will never have those great memories of such a wonderful small town. Looks like it makes sense. My brother’s name “Jack” was used by the family, friends knew him as Johnny. My dad’s name is John. Well, Jerry I guess, if you graduated in ’62 and me in ’69, we somehow got our wires crossed. It wasn’t your Dad I knew, it must have been your brother, Jack. That is if you are the Meskanick’s from Overland Ave in Duquesne Place. Anyway, sorry about the mix -up. I was pretty sure that was you. It has been many years since I saw you. Hopefully when we have our 50th reunion next year we can all get together. Jerry, What school did you graduate from ? I graduated in 62 but don’t remember you. DHS. I remember your name. I went to Duquesne High School and graduated in 1962. Tom, we used to play ball at Polish Hill. You were good friends with Hoppy Voytko (sp). Do you remember me? Ed Flanagan. I mostly hung around with Charlie Oeler and Ken Weber. Hoppy Young not Voytko! By the way, my niece lives in Columbus, In. There name is Sasena. Otter Creek is a great Golf Course, have played there a couple times. In regards to the relationship to Johnny Meskanick, I am John’s eldest son Jerry, I have a sister Sandy and a brother Jack. I do not recognize the Chermonitz name. Where did you live in Duquesne and how did you know my father? Hi Jerry, I grew up in Duquesne Place where I met you father. We were not “best buds” but hung around with all the kids in the area. Your father was a year or two older than me. I do remember that he had a basketball hoop on a street light pole and we kids woulds play for hours out on the street by his house. At least until our dad’s called us in after the street lights came on. Hi, A fellow gave me a beer bottle today identified as Eagle Brewery, Duquesne, Pa. Do you or any of your contacts know anything about this Company? My family immigrated from Slovakia to Duquesne circa 1890. No info from me about the Eagle beer, however, I was friends with a Johnny Meskanick who lived on Overland Avenue in Duquesne Place next to Babic’s Grocery. Any relation? This would have been in the 50’s and 60’s. Jerry, when did you graduate?? 1962? can you tell me what years Green Gables was open? remember going there for lamb but can’t remember how old I might have been. I am Norma Dain’s daughter, She was a waitress at Green Gables. I grew up in the back with Pete Longcaric telling me stories of Croatia. We were all Croatian. My grandfather was, Wally Mitchell. He owned a bar on Hamilton Avenue. I loved getting Lamb from Green Gables on Croatian and Serbian day. I dated Marty Soltis through high school and worked at Kennywood. Such fond memories of Dusquene. Kim, by any chance, do you remember my Uncle Joe (Puskaric)? He stayed at Green Gables for as long as I remembered. Any recollections? Terri and I grew up together. I’m on a roll! Sorry. Green Gables sat at the Kennywood end of the Kennywood bridge right where McDonald’s is today. It was a huge building, 2 stories tall as I recall. The doors were always wide open in the summer (those the days before everything was airconditioned) and we kids always peeked in. It is true that many a picnic at Kennywood was probably ruined because the men would sneak away from the picnic pavilons to seek refreshment at Green Gables. It was, to a kid, kinda frightening (not sure why). If you walked across the bridge to Kennywood there was an 8ft fence with some very mean dogs that came out of nowhere to scare the daylights out of you. They lived behind the Green Gables. Although, to the men inside, I’m sure it was an oasis. Jim, you’ve done it again. Things I almost forgot! 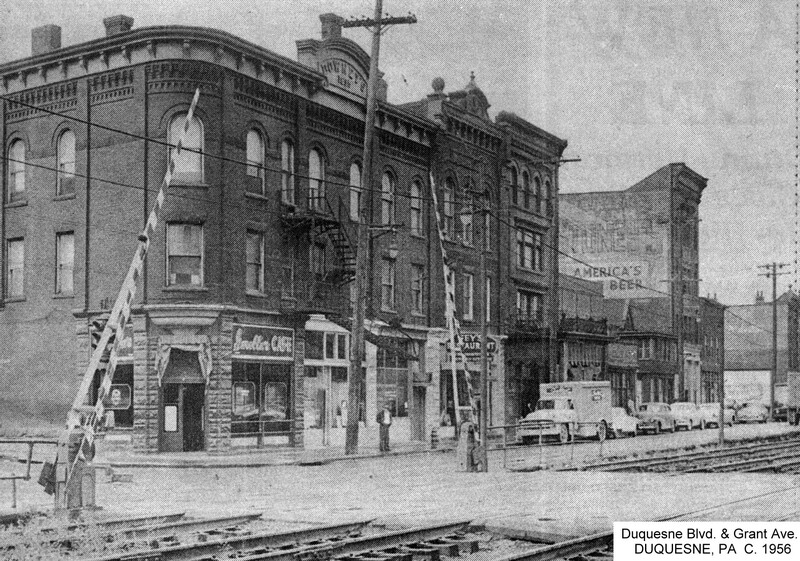 Duquesne Place had two stores plus Palchek’s drug store (as I recall). Babics was on the bend of Overland Ave, in a building which had apartments above it. Mrs. McConnel (sp?) the head cook at Holy Name lived above it with her husband and son, Larry. This little grocery/butcher served our neighborhood for years. My mom would send me there on errands and allow me to keep all the pennies I received in change. I got in trouble one time when I asked for ten cents in pennies, and they gave it to me! Lesson learned. The other little store was on Overland Ave, also, and was called “Mary’s”, run by Mary Baliban who was Mike Balaban’s (of our class @ HNS) aunt. She sold penny candy, mission pop, and little things like milk and detergents. Oh, the Babics had two sons that I know of, both older than me. The younger was named Walter. At one time he had a Cobra sportscar and would race all over Duquesne Place with it. How cool was that? He hung out with my cousin, Tommy Karch. I remember so many of these places. Wasn’t there a movie theater near Karen’s Shoe Store? And does anyone remember that x-ray machine they used to size your feet? I was constantly putting my feet in that thing. Was that a real x-ray machine? And there was a Salkovitz (sp?) Dress Shop that my mother used to visit now and then. What a place – jammed packed with dresses. I saw my very first movie at the Plaza Theater. My older brother took me to see Forbidden Planet when it first came out….with Robby the Robot! It came out in 1956. Hello Jim, congratulations on your project which I found very interesting to read. My cousins and I grew up around there…in the 40’s and 50’s. We are now looking back at our ancestry, of the John Thomas and Barbara Sakos Thomas family going back to 1906. We’ve found them listed in the Census reports and ship’s manifests etc. We are now trying to find out what happened to our grandparents’ siblings. How would you go about finding families who lived in Duquesne during certain years? Are directories kept anywhere? I think your best place to start is the Mifflin Town SHip Historical Society. Jim Hartman is a wealth of knowledge and should be able to direct you to the proper resources. Another good resourse is Ancestry.com, but it is fee based. Good luck in your search. I won’t add any new ones at this point but I have a few comments on those listed. The GBU was managed by Vince Keiffer for a number of years. He was the body man for my dad till our business closed. What a great guy! Duquesne Auto Service moved nearer to Kennywood and sold pontiacs. The owners name was George Schrift and he had a Chris Craft boat on Conneaut Lake. My family was invited to their home and cottage. I enjoyed the Christmas dinner at their house as I was able to be the engineer on a two train layout under the tree. I met my future wife while working at Izydores. She was a daughter of a customer and I was stock guy and deivery person but it would take some years for our paths to cross again. Raible Plumbing was owned by Charlie Raible and he had the most beautiful red 35 Ford pickup I ever saw. I always wanted to buy that truck but he passed away before I was able to do it. Does anyone know if Ikach’s Market was related to a hotel of the same name? I went thru DHS with George Ikach who was a great guy and comedian but I heard he had an untimely end. Great memories ! I grew up on 5th street and my Mom bought groceries at Soffer’s on Crawford Ave. Every purchase was put on a tab, and you paid the bill at the end of the month.My aunt Mary worked at Royal Mfg. I moved to Skyline Dr. in West Mifflin when I was in the 7th grade, ( About 4 blocks from Paule’s Lookout, going toward Duq.) One of the many jobs I had growing up included Butler’s Drug Store ( across from St. Joseph’s ) while in H.S. ( DHS class of 1960 ) A small world – David Butler, the surviving son, is my attorney here in Marietta, Ga ! Do you know anything about a Jim Butler who was also a son of the owner? He and I went to school at St. Josephs. Thanks for the update on Jimmy Butler, Ken. He and I hung out for a while. I can remember a pony they bought for a prize give away at the drugstore. It lived in their garage till the drawing. That thing was a biting fool. I never put an entry into that drawing. Someone won a very dubious prize. I’m am honored to say that I have stumbled acrossed this awesome blog site! My grandmother and my grandfather are from Duquesne! I graduated from from West Mifflin in 2005 and love everything from the MON-VALLEY!! I have extensive roots all through the river towns and I’m currently going to school for education.. My goal is to enrich student knowledge about the valley’s past. If anyone has information about my family or anything that I talked about please contact my email. I’m thrilled you found my blog! Welcome home! Thanks appreciate the warm welcome! Proud to be a HUNKY and have Duquesne roots!